Every December 5, on International Volunteer Day, the United Nations recognizes volunteers worldwide for their efforts and celebrates the impact that volunteerism is making toward achieving the Sustainable Development Goals — a collection of 17 global goals set by the United Nations General Assembly in 2015. In celebrating International Volunteer Day, we shine the spotlight on the more than one billion people globally who are giving their time in support of their communities and the natural landscapes they call home. This year the theme for International Volunteer Day is “volunteers build resilient communities.” Resilience, essentially, describes our capacity to recover from difficulties — to bounce back when we are faced with challenges. In a world faced with the impacts of climate change, habitat fragmentation and species loss, increasing the resiliency of our communities and of natural landscapes is more important than ever. 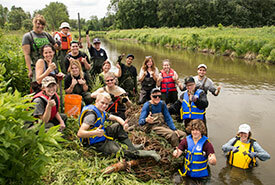 At the Nature Conservancy of Canada (NCC), volunteers are on the frontlines of our conservation work. 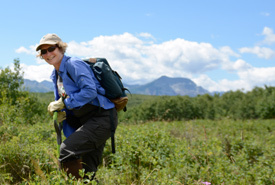 Through our Conservation Volunteers program, people of all ages and backgrounds are joining forces to support biodiversity and to care for natural systems. 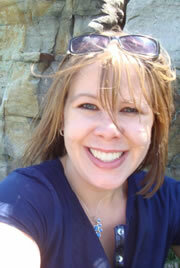 In the process, they are strengthening nature’s inherent resiliency. From restoration projects, to shoreline cleanups and species inventories, people are getting their hands dirty and demonstrating how volunteers can be a true force for nature. In the Minesing Wetlands of southern Ontario, Conservation Volunteers are helping NCC restore and revegetate some key areas of this rare and globally recognized marsh, swamp and fen complex. Since 1974, NCC and our partners have protected over 12,000 acres (4,972 hectares) of significant habitat in the area. Together with the support of volunteers and the Nottawasaga Valley Conservation Authority, NCC has also restored approximately 25 acres (10 hectares) of deciduous swamp forest and buffered 5.5 kilometres of rivers and streams over the last 10 years. 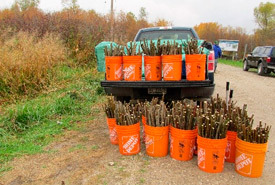 In 2018 alone, volunteers planted 2,400 trees and 2,400 wetland plants as part of these ongoing restoration efforts. Not only will these trees create habitat for species at risk like the cerulean warbler, they will also help increase the wetland’s water retention. For communities downstream, such as Wasaga Beach, this means a decrease in the risk of devastating flood damage. It’s a win-win for the watershed and the people living within it. Located in the southwestern corner of Alberta, the Waterton Biosphere Reserve (WBR) is one of only 18 biosphere reserves in Canada. Biosphere reserves are living demonstrations of resiliency, with communities working together to balance economic, social and environmental needs. 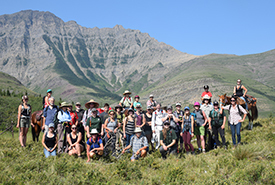 For decades, NCC has worked with local ranchers and landowners to protect important wildlife habitat around Waterton Lakes National Park. Since 2007, NCC’s Conservation Volunteers have supported 40 stewardship events within the biosphere reserve. They’ve collaborated with the community on weed pulls to boost local biodiversity, and helped ranchers remove or improve fencing to reduce barriers to wildlife movement. Volunteers are not only playing a key role in caring for NCC’s conservation lands, their efforts are also supporting the WBR’s ongoing goal of integrating biodiversity conservation and traditional ranching livelihoods. Volunteerism is part of NCC’s social fabric. As a not-for-profit, we are made stronger by the support of the communities and partners we work with, and the volunteers who generously share their time and passion for nature. When we join forces and work together on these issues, we are collectively more capable of enacting meaningful change. That is what volunteerism is all about. Thank you to the more than 2,500 people (and counting!) who volunteered with us this year, and to the almost 60,000 people who have joined our volunteer network and expressed an interest in getting outside with us in 2019! We invite you to become part of our team! Learn more about our Conservation Volunteers program by signing up to receive email updates and visiting ConservationVolunteers.ca. You can also join the global community in celebrating International Volunteer Day and hear more success stories from around the world by following #IVD2018 and #ResilientCommunities on social media.